Funny story....when I first brought my husband to Florida to meet my parents, I was so excited for him to experience all of my favorite things from home. The beach, air boat rides, Publix, grouper, the list is actually a long one, so I will spare you guys. Boiled peanuts were at the top of the list. Especially the ones bought on the side of the road. In my opinion these taste the best. Needless to say, my hubby was not as fond of the tasty snack as I am. 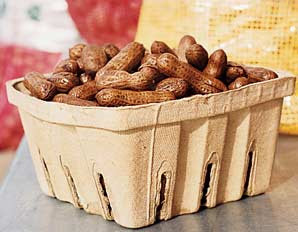 Boiled peanuts are definitely a staple of the south and also an acquired taste. I didn't realize this, I just wrongly assumed that everyone loved boiled peanuts as much as I do. Oh well! I try to infuse as much of my Florida heritage into our life here in Texas so I make boiled peanuts at least once or twice, during tailgating season. Preparation: Rinse the raw peanuts several times to remove any dirt. Place the rinsed raw peanuts into a crockpot/slow cooker. Add water to the pot, enough to float the peanuts, leaving at least 1" room at the top of the pot. Add salt, about 8 tablespoons (1/2 cup) of salt per gallon of water. Cook on low for 10 hours. *I like to experiment with different flavors for my boiled peanuts. You can add cajun seasoning, old bay, garlic, red pepper flakes, or lemon pepper. Have you ever tried adding seasoning salt? That would be interesting, not sure how much to add, seeing I love salty boiled peanuts.